This post is a short follow-up to the earlier one on Calvinism and determinism. I realize I should have said something about the distinction between ‘soft’ and ‘hard’ determinism, and how that relates to Calvinism. So here I remedy that oversight. Recall that compatibilism refers to the thesis that determinism is compatible with freedom (i.e., that people can make free choices, for which they can be held morally responsible, even if determinism is true). As I noted in my earlier post, there are different types of determinism and thus there can be various compatibilist theses. One could be a compatibilist with respect to some types of determinism (e.g., divine determinism or causal determinism) but an incompatibilist with respect to other types of determinism (e.g., logical determinism or physical determinism). But let’s leave that complication aside for a moment. Given this basic understanding of compatibilism, we can define ‘soft’ and ‘hard’ determinism as follows: soft determinism is compatibilist determinism and hard determinism is incompatibilist determinism. In other words, soft and hard determinists agree that determinism is true, but they disagree about whether free choices are possible given that determinism is true. The ‘softies’ say they are; the ‘hardies’ say they aren’t. It’s worth noting in passing that holding to a compatibilist view of free will doesn’t commit one to a position on whether or not determinism is actually true. The same goes for holding a incompatibilist view. Compatibilism as such doesn’t entail determinism; incompatibilism as such doesn’t entail indeterminism. In principle, one could be a compatibilist who denies determinism or an incompatibilist who affirms determinism (the latter would be a hard determinist). Likewise, one could be a compatibilist or an incompatibilist while being ‘agnostic’ about determinism. Compatibilism and incompatibilism are simply theses about whether two claims are logically compatible; neither involves a commitment to the truth of either of those two claims. So where does Calvinism fall on this issue? Since Calvinists believe that we can be held morally responsible for our choices, and therefore we have whatever kind of freedom is necessary for moral responsibility, Calvinists are clearly soft determinists with respect to that kind of freedom. 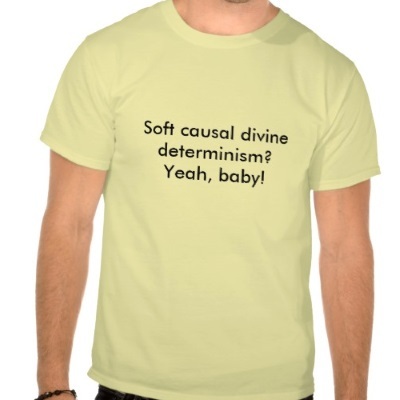 If I’m right that mainstream historic Calvinism represents some version of causal divine determinism, then to be more specific we should say that Calvinists are soft causal divine determinists. Admittedly that doesn’t exactly roll off the tongue, and I can’t see the t-shirt catching on, but at least it has the virtue of philosophical precision! One final thought. What about hyper-Calvinists? Should we say that hyper-Calvinists are hard determinists, since they deny that the unregenerate have any moral duty to repent and believe? I doubt that would be accurate. I’m not aware of any hyper-Calvinist who denies moral freedom altogether, i.e., who claims that no one, elect or non-elect, regenerate or unregenerate, can ever make free choices for which they are morally responsible. Hyper-Calvinism is unbiblical and heterodox, but it wouldn’t be accurate to characterize its proponents as hard determinists in the strict sense. This entry was posted in Philosophy, Theology and tagged Calvinism, compatibilism, determinism, hard deterrminism, hyper-Calvinism, incompatibilism, soft determinism. Bookmark the permalink. 2 Responses to Determinism: Soft or Hard?